I have really come to love the South. And the beautiful strip of land that links Charleston, Beaufort and Savannah are magical. Now that Jetblue has great flights into Charleston (and if you don’t want to rent a car, you can always take a train between the towns) and it’s beautiful country to drive through, especially in the early spring before the humidity and heat set in. 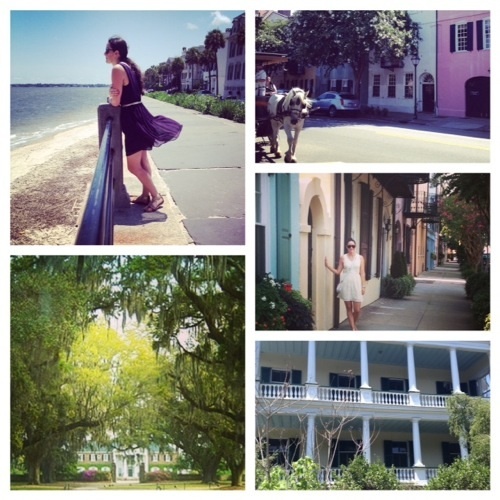 After a wonderful July 4th spent down South last year, I decided to return but stay in Charleston to explore more of the surrounding area (like Folly Beach). With the summer heat, everything slows down and yes, the living is easy (had to). Just a quick flight away from JFK on Jet Blue, you will wonder why you didn’t go before. It’s charm, grace and history await you. As I had suggested before, do a City tour, walk around the historic district & waterfront, go on a boat tour…this time I ventured out for a day at lovely Folly Beach which was well worth it – especially on July 4th where the local airforce made passes overhead and the coast guard flew the flag up and down the beach (unexpected for this New Yorker). Also made it out to a few local plantations this time. The top ones are Middleton Place (where I went), Drayton Hall, Magnolia and Boone Hall. It’s endless! The food scene continues to excite, and many foodies have been flocking to Charleston for good reason. In addition to The grocery, Fig, Leon’s, Circa 1886, The Ordinary, Husk, Martha Lou’s kitchen, Bull Street Cafe (on king) and that piece of famous coconut cake from Peninsula grill…I finally hit up Jestine’s Kitchen for its famous fried chicken and it was worth every bite! I also spent more time in a neighborhood north of downtown, where Leon’s is, but had a great breakfast at the Park Cafe (tip: if you are by yourself, the bar comes in handy and you always meet nice locals there). Chef Sean Brock is doing fantastic with food in the City, and recently did an episode with Anthony Bourdain and part time resident Billy Murray, that I highly recommend. Watch here. Get an overview of the city first with a hop on-and-off Old Savannah history tour, and maybe a night walk ghost tour. Everything is close anyway, so you can walk (or bike) everywhere! Shop stores on broughton street to the City Market (small but quaint), River Walk (you can even cruise down the Savannah River on a boat if you like. Also, hit River sweets for candy), savannah colonial park cemetery (seriously found dueling pistolier grave, fantastic! ), Owens-Thomas house museum (or other Telfair museums, but this is restored to exactly how homes were 1820s-30s and gives you a true sense of place), and just walk in general to admire the architecture & Savannah’s Squares, which is a triumph to city planning and elegance. And finally, relax at Forsyth Park, or head out to Tybee for the day if you are able. *It should be noted, while in Savannah…relax already! I really enjoyed the new Brice Hotel (Kimpton) and strongly recommend it, but the last time I was there I stayed in the most charming Airbnb in the historical area and if you are a solo traveler, it’s a must do to get a real sense of the area.